I'm currently in the middle of writing an article on kettlebells for bodybuilding, which is not a new concept. If you look at pictures of John Grimek, you'll find him doing kettlebell curls, which were a favorite of his. Q:I must say I enjoy reading what you write and find you somewhat an inspiration. I have wanted to be a police officer my entire life, but considering a juvenile criminal record (JUST expunged) I can't join the Marines as an MP. I can't join period either, because I got my GED and so I'm volunteering at the YMCA, and answering phones at the fire department until I start college for a degree in Education. I do have one area of concern. I used to box. I'm 17, but started boxing when I was 16. I weighed 115 and was benching 180. Around New Year’s I cut myself on the wrist and severed several tendons, which put me to all running and biking for a good many months. Just this past month I've gotten back to work out, but I've found myself hesitating from the bench press due to a concern that it might affect my push up reps.
Q: "Hi James, love the blog. I've been following your 10-8-6-15 routine for a couple of weeks. Yesterday, I felt some forearm pain while doing bicep curls. I had forearm splints last summer that took a couple of months to recover from. How can I minimize the risk of developing forearm splints while continuing the routine and increasing the weight? Should I just drop the weight that I'm lifting or are there exercises, stretches or equipment that can prevent them from developing?" Normally I'm a very low profle guy. I don't like talking all the time, but when I talk, I'm make sure my words are meaningful. I don't have a lot of manic energy like some people. But something happens when I'm pushed past a physical limit. It's like a back up drive of adrenalin that kicks in. It' always been like this for me. One day as a recruit in the police academy, we all had to line up in the hall and do group pushups in cadence. In other words, we all had to go up and down at the same time on command of the TAC officer. 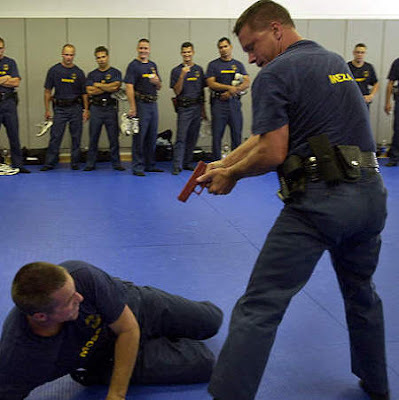 Of course the TAC officer barking the pushup commands would make the class stay in the bottom pushup position for prolonged periods of time to make them exceptionally painful. My classmates would collapse on the floor, because their arms felt like spaghetti and their chests were burning with lactic acid. Q: "Hi James, I was reading up on some info you had about the three different body types, and how they should workout and eat. Well, I am an ectomorph, and I was wondering if you could give me a specific workout routine? "I'm 16. My bicep muscle size is about 13.2 inches, and I want my muscles to get bigger quicker. Now what I normally do is workout the upper body one day and legs the next. "I have some weights I use at home that are only 40 pounds all together, so the muscles I workout the most are my biceps, triceps and shoulders. What I do in my workout routine is pretty intense. It's like this: using a 25 pound weight I do one set of 12 reps. Then without rest I do my triceps with the whole 40 pounds and do 1 set of 12 reps. Then without rest I use a 30 pound weight and do 7 bicep curls. Then without rest I do the same triceps exercise. Then without rest I use a 35 pound weight and do 4-5 curls and then the same triceps exercise. Q:I have a few questions concerning forearm size and grip strength. I remember that you mentioned thick bar exercises in one of your blog posts. I haven't been able to find information on those exercises. What are some thick bar exercises? Another article suggested that doing compound lifts such as deadlifts and snatches will strengthen your grip and increase forearm size without the need for isolation exercises. Is that something that you would suggest? My Answer: Do yourself a favor and get a pair of thick bar heavy handles. Thick bar exercises just mean you do regular exercises with thick bars and dumbbells, so no matter what exercise you do, you're working the forearms. Heavy handles allow you to work most of the conventional bodybuilding exercises with a thick grip.